This Post has already been read 595 times. 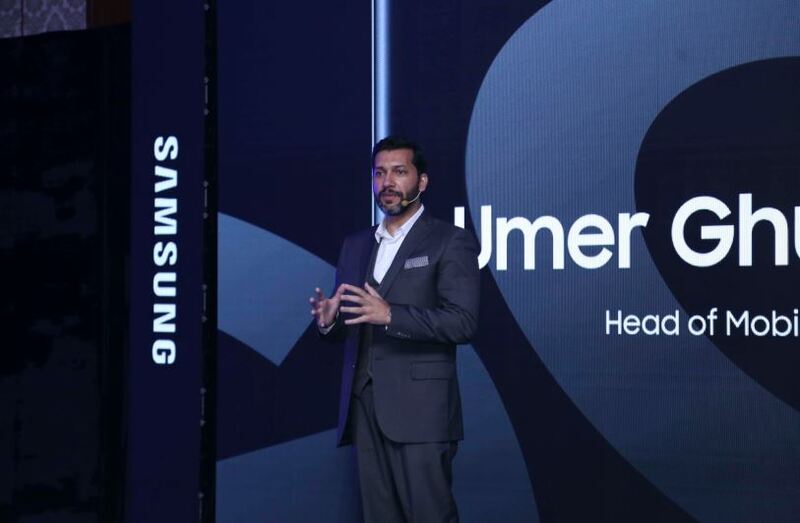 As a way of celebrating a decade since the launch of the first Galaxy S, Samsung Electronics Pakistan, one of the leading electronics companies in the world, launched the Galaxy S10 | Galaxy S10+ at a press conference in Karachi today. The new revolutionary smartphones saw a record number of pre-orders since it’s unveiling in February and have also received extremely positive feedback. The Galaxy S10 line is engineered to meet the distinct needs of today’s smartphone market, so consumers can do more of what they love. Each device delivers a next-generation experience in the categories consumers care about the most: groundbreaking innovations in display, camera and performance.For consumers looking for a supercharged device, Galaxy S10+ promises to take every spec – from display, to camera, to performance – to the next level. The Galaxy S10 line offers consumers more choices and expects to set a new standard for smartphones. ROY CHANG Managing Director Samsung Electronics Pakistan & Afghanistan” Our vision is to be the leading innovator of new mobile experiences that enrich the lives of our customers. We believe that meaningful technology has the power to unleash the true human potential and that is exactly what our revolutionary S10|S10+ has the power to do”. Some of the features of the Galaxy S10 include Samsung’s best screen yet, the world’s first Dynamic AMOLED display. As the first HDR10+ certified smartphone, the display delivers vivid digital content combined with dynamic tone mapping which provides a wider range of color for a brilliant, more realistic picture. Galaxy S10’s Dynamic AMOLED display is also VDE-certified for vibrant bright colors and extraordinarycontrast ratio for even deeper blacks and brighter whites. Verified by Display Mate, consumers will be able to enjoy exceptionallyaccurate colors on their mobile device– even in harsh sunlight. The Dynamic AMOLED display also reduces blue light through its TÜV Rheinland-certified Eye Comfort display without compromising picture quality or adding a filter. The result of a groundbreaking engineering process, Galaxy S10’s unique Infinity-O Displaypacks an array of sensors and camera technology into a hole-in display – allowing customers to maximize their screen real estate without any distractions. Ultra Wide Lens: A first for the S Series, Galaxy S10 offers an Ultra Wide Lens with a 123-degree field of view, like the human eye. Perfect for impressive landscape shots, big panoramas and even fitting the entire extended family into the photo. Super Steady & High-Quality Video Recording: Galaxy S10 offers Super Steady recording with digital stabilization technology which allows customers to capture a variety of moments. Both front and rear cameras can shoot in upto UHD quality, and in an industry first, the rear camera gives the customers the flexibility to record in HDR10+. Galaxy S10 is built with premium hardware and machine-learning-based software. From brand new power sharing capabilities to AI-powered performance enhancement and Intelligent Wi-Fi, Galaxy S10 is Samsung’s most intelligent device yet, from the inside out. Wireless PowerShare: Samsung introduces Wireless Power Share on Galaxy S10, making it possible to easily charge Qi-certifiedsmartphones and even compatible wearable devices. In addition, Galaxy S10 is capable of charging itself and a second device simultaneously via Wireless PowerShare, while connected to a regular charger. Intelligent Performance: The new AI software on the Galaxy S10 automatically optimizes battery, CPU, RAM, and even device temperature based on how customers use their phone and continues to learn and get better over time. Leveraging AI-capabilities, Galaxy S10 also learns how they use their device in order to launch their most frequently used apps faster. Intelligent Wi-Fi: Galaxy S10 comes with Intelligent Wi-Fithat allows for an uninterrupted and safe connection by seamlessly switching between Wi-Fi and LTE, as well as showing alerts of potentially risky Wi-Fi Galaxy S10 also supports the new Wi-Fi 6 standard, making it possible for better Wi-Fi performance when connected to a compatible router. Bixby Routines: On Galaxy S10, Bixby automates customers’ routines and provides personalized recommendations to make life easier. With pre-set and personalized routines, such asDriving and Before Bed routines, which are customized based on customers’ habits, Galaxy S10 makes things simpler by automatically reducing device touches and cutting steps out of the day. Samsung Members Benefits: The new Galaxy S10 not only offers top of the line features to its customers but also offers exclusive benefits via the Samsung member’s app. S10|S10+ owners can avail a 25% discount on Swarovski crystal jewelry. S10|S10+ owners can avail a 20% discount on Careem rides. According to Display Mate, peak luminance of up to 1200 nits. Galaxy S10, and S10+’s display has been awarded a certification for 100% Mobile Color Volume with a contrast ratio of 2,000,000:1 by VDE Germany. According to Display Mate, 0.4 JNCD color accuracy at DCI-P3 color gamut. TÜV Rheinland, a globally recognized certification institute, awarded Galaxy S10 and S10+ display the Eye Comfort Certification based on its ability to drastically reduce the harmful effects of blue light. This certification can be found on www.tuv.com with the ID 1419064785. Available on Galaxy S10, S10+ and S10 5G. Galaxy S10e has a Fingerprint Scanner located on thepower button. HDR10+ recording quality may vary based on sharing platform and playback environment; HDR10+ color is only available on supported devices or platforms. Wireless PowerShare limited to Samsung or other compatible smartphones with WPC Qi wireless charging, such as Galaxy S9, S9+, S8, S8+, S8 Active, S7, S7 edge, S7 Active, S6, S6 edge, S6 Active, S6 edge+, Note9, Note8, Note FE, Note5, and Samsung wearable devices including Galaxy Watch Active, Gear Sport, Gear S3, Galaxy Watch (46/42mm), and Galaxy Buds. May not work with non-Samsung accessories or covers. May affect call reception or data services, depending on your network environment? If you charge two devices simultaneously, Fast Wireless Charging 2.0 for Galaxy S10, and S10+ may not be available. Bixby Routines Driving routine only available in cars with Bluetooth capabilities. S10|S10+ owners can avail a discount of up to PKR 26,000 on selected Samsung Smart TV’s. S10|S10+ owners can get priority service at all service centers of Samsung’s authorized distributors across Pakistan. S10| S10+ customers will get 10GB mobile data free from Telenor Pakistan.